2nd August, 2013, The creative team behind 2011’s smash hit The Inbetweeners Movie today confirmed that a second movie is in production and will be released in cinemas across the UK & Ireland early August 2014. The follow-up to the UK’s most successful comedy film of all time will be shot later this year, reuniting the hapless Jay, Neil, Simon & Will. 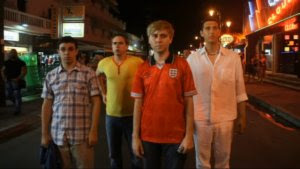 Creators Iain Morris and Damon Beesley commented, "We couldn't be more excited to be making another Inbetweeners movie with Simon, Joe, James and Blake. Frankly it's pathetic how much we've all missed each other. A new chapter in the lives of the Inbetweeners feels like the very least we can do to thank the fans for their phenomenal response to the first movie." The film will be produced by Bwark Productions who will co-finance with Channel 4/Film4. Bwark is a Zodiak Media Company and Zodiak Rights are the international sales agent. Entertainment Film Distributors will distribute the film in the UK. Having started life on E4, the multi award-winning series went on to enjoy massive success with its debut film, The Inbetweeners Movie, which was fully financed by Channel 4.